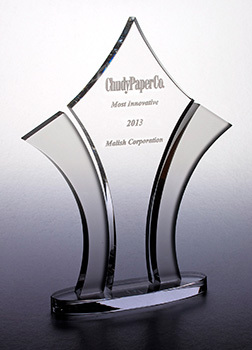 March 2013 – Chudy Paper, a 100-year-old distributor of food service disposables, janitorial supplies and maintenance equipment, recently awarded The Malish Corporation their “Most Innovative” award at their recent vendor day held on February 28th. Chris Shaw, Northeast Regional Director of Sales for Malish, accepted the award on behalf of Malish. “We are thrilled to have received this award from Chudy Paper. Our relationship with Chudy has grown consistently over the last few years and we are proud to be a valued supplier to a distributor with this rich a history,” said Mr. Shaw. The Diamabrush By Malish line consists of a system of concrete prep and polishing tools that are used on standard floor maintenance equipment to keep concrete floors smooth and shining with routine maintenance. In addition, the line also includes Wood and Mastic Removal tools.